Are you looking to have a licensed & insured air conditioning contractor to repair your air conditioner? 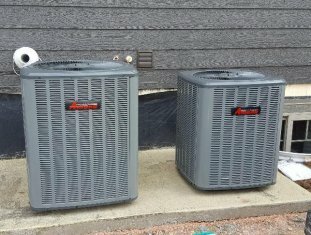 Anderson Heating and Air Conditioning can repair any brand of central air conditioners. If your air conditioner cannot be repaired, we install 13 or higher SEER rated central air conditioners to provide the highest level of comfort in the hot summer months in the Rapid City area. Higher SEER air conditioners save you money on operation by requiring less electricity to move the heat out of your house! For replacement central air conditioners and new construction, we install Amanaand Goodman brands, with ozone friendly 410a Freon. Want to add life and efficiency to your current Central Air Conditioner?